Coming in Thirds (4' ACA) commissioned for the Elementary/Middle School Division of the 2010 Renée B. Fisher Piano Competition. 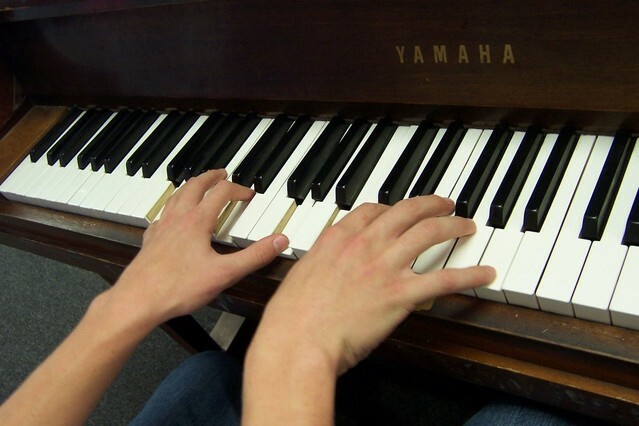 Accordingly, it provides opportunities to demonstrate pianistic ability, both technical (dexterity, touch, and control) and musical (clarity and expressivity), while having fun. The opening impertinent, jazzy lick bounces through a series of transforming adventures as the piece unfolds, with a sassy attitude throughout. Pianist Jai Jeffryes adroitly captures this spirit in his sparkling recording of Coming in Thirds on his CD, Tangent Shores – Amethyst. The title refers not to the relative order of finish in the competition – where the object is to come in first, after all – but to the melodic and harmonic structure of the music, which is based on minor thirds. Twilight Reverie (5' ACA) a tone poem in which the opening figure, composed of two rising leaps, is echoed and turned in on itself, acquiring harmonic coloring along the way. These elements are patiently recombined and re-combed, exploring a range of colors increasingly rich yet diffuse, until finally reaching a definitive expression before dissolving back into its elements. The process to me is evocative of a clear sky at twilight, where the unhurried setting sun creates a collection of colors that gradually combine and recombine, becoming brilliant in a final moment before dissipating. On the Edges (9'30" ACA) goes by in six sections contrasting in pulse and energy. The first section is a toccata with two-handed arpeggios gradually turning into chords that get thicker and thicker before returning to the opening arpeggio motive. A dialogue follows where slow-moving chords are in counterpoint with quicker, arpeggiated figures derived from the toccata’s opening figure. Then there’s a quiet lyrical reflection – again based on the opening motive – eliding into a cadenza with arpeggiated figures that increase in range and intensity before dissolving into a trill. The next section turns the toccata’s opening motive into the subject of a four-part invention, the first in a series of three linked by thematic rotation: the counter-subject of one invention becomes the subject for the next. This cycle completes as the subject of the first invention becomes the counter-subject of the last, and ends as the three subjects are combined, segueing into an extended return of the opening toccata. All this is brilliantly captured by Peter Vinograde in his recording on Phoenix USA. Homonyms (1'15" ACA) a whimsical encore piece. Quick Study (1'15" ACA) an energetic encore piece. Etude with 'tude (4' ACA) an octatonic take on boogie-woogie. Just Keyboard Respect (4'15" ACA) a tribute to the late J. K. Randall. Retrogressive Study: a theme and five polite variations (2' ACA)the title is a pun on both its propelling musical element (retrograde) and its stylistic throwback: if Chopin could write a Revolutionary Etude, I could write a reactionary one.